Some behavioral issues in horses may be related to tooth pain, which is not readily recognized by owners, researchers say. Dr. Jaana Pehkonen, of the University of Helsinki, along with Drs. Leena Karmab and Marja Raekallioc, interviewed 47 horse owners whose equines had had a tooth removed because of a bacterial infection in the tip of the tooth root. These infections are common in horses. The owners answered 23 questions that dealt with their horse's eating and bit behavior, as well as their general demeanor both before and after tooth extraction. Before the extraction, owners said they noticed social withdrawal, difficulty eating, evading the bit, headshaking, resistance to bridling and even aggression. There was a marked decline in these behaviors once the tooth was removed, suggesting that the behaviors could be associated with dental pain. 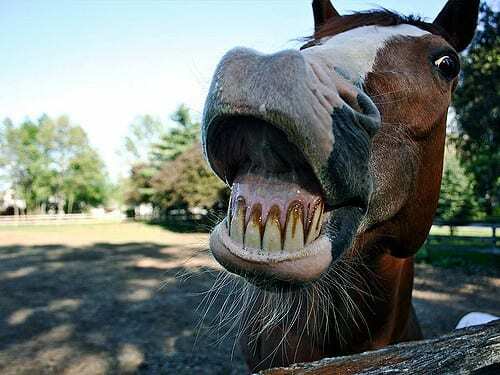 Half of the horses that needed a tooth removed were diagnosed during a routine exam, indicating that the owners were not aware that the horse was in pain. Many times the onset of adverse behaviors is slow, so some owners may not notice them. The scientists reiterate that horse owners need to be trained to recognize that poor behavior could be related to dental pain to ensure the well-being of horses. Many of the more-common physical signs, such as swelling, bad breath and nasal discharge are more-readily noticed by horse owners. This entry was posted in Horse Care and tagged abscess, bacterial infection, extraction, headshaking, infection, pain, resistance, routine, tooth removal by Paulick Report Staff. Bookmark the permalink.